PayPal (s ebay) is forming a joint venture with Softbank Corp. to help launch its small business mobile payment product PayPal Here in Japan. The joint venture, called PayPal Japan, will include investments of $12.5 million each from both PayPal and Softbank, a leading telecom and Internet company. The partnership should give a big boost to PayPal, which is launching PayPal Here in Japan after rolling out the service in the U.S., Canada, Hong Kong and Australia. Softbank has 29 million mobile subscribers and also enjoys distribution through thousands of retail outlets. While PayPal has spread to 190 markets including Japan, the company said it saw an opportunity to bring a small business payment tool to Japan, which has low credit card penetration. The two companies believe they can make a big dent in Japan’s retail market, which is worth $1.7 trillion dollars and has 4.7 million small businesses. The PayPal Here service, a competitor to Square, allows merchants to take credit card payments through a mobile reader along with other forms of payment. PayPal Here also includes a mobile app that allows merchants to manage their business. PayPal Here can get people up and running quickly without having to wait for a merchant account. Japanese merchants will pay a transaction fee of 5 percent on card swipes for Visa (s v), MasterCard (s ma) and American Express (s axp). The service will also give merchants a way to handle online payments. This could be attractive for small businesses, which make up 99 percent of all businesses in Japan. 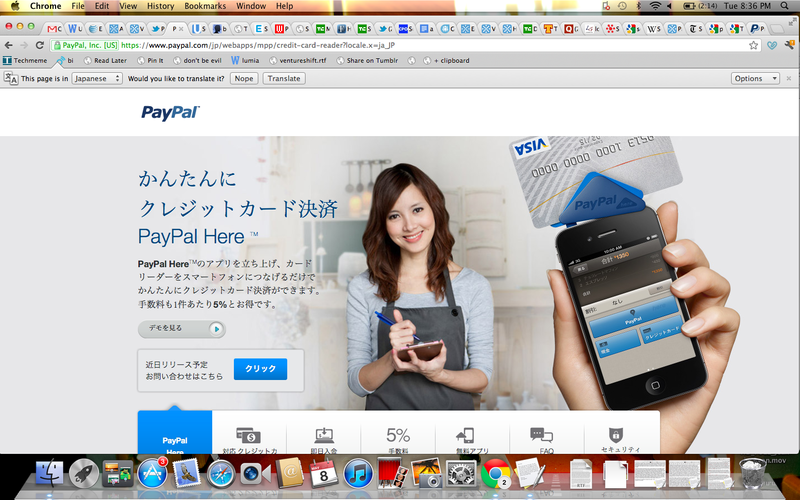 PayPal has already signed up more than 200,000 merchants for its payment tool. The reader and app is available now immediately for iPhone users (s aapl) and the Android (s goog) version will be available in the coming weeks. The launch of PayPal Here in Japan shows how PayPal is using its heft to expand quickly around the world with its mobile payment tool. It also highlights the challenge for Square, which is still just based in the U.S.
We’ve packed a whole lot of choice into one ingenious, little button. The PayPass checkout button not only lets you use our PayPass Wallet to checkout quickly and securely, it lets you use any digital wallet offered by a PayPass partner. PayPass online gives your customers a faster, easier way to checkout online and gives you a way to increase sales without significantly changing the way you process payments now. PayPass Wallet by MasterCard is a free digital wallet service that makes online shopping safe and easy by storing all of your payment and shipping information in one convenient and secure place. With PayPass Wallet, you simply shop, click and checkout faster online. Why Japan, not the UK? Just curious. Anyhow, I love my mPowa (www.mpowa.com) and won’t trade it for PayPal Here even if they reach UK.